Ángel Páez has extensive experience working in Peru as an investigative journalist on stories about corruption, drug trade, political violence, arms trade and other forms of organised crime. He joined IPS as a correspondent from his country in 2005. Born in 1963, Páez studied journalism at the Universidad Nacional Mayor de San Marcos in Lima and started working at the daily newspaper La República in 1985. In 1990 he founded the Unidad de Investigación, a collective of journalists that uncovered the corruption scandals surrounding the government of Alberto Fujimori (1990-2000). Páez was the first to publish a story on one of those cases, which later led the Chilean courts to hand in the perpetrator to the Peruvian authorities. A correspondent in Lima for the Argentinean newspaper Clarín and the Mexican magazine Proceso, Páez is a member of the International Consortium of Investigative Journalists, a Washington-based organisation that promotes global investigations. 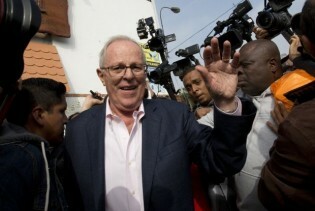 It is finally official: Pedro Pablo Kuczynski won Peru's presidential elections by the thinnest of leads, and Keiko Fujimori once again just barely missed becoming president - although her party holds a solid majority in Congress, which means it will have a strong influence during the next administration. Thousands of Peruvians took to the streets of Lima and other cities to protest the likely triumph in the Sunday Jun. 5 runoff election of Keiko Fujimori, the daughter of former president Alberto Fujimori, who is serving a 25-year sentence for corruption and crimes against humanity. The Peruvian legislature is investigating a contract with an Israeli company, entered into by the previous government for advising and training the military, after audit bodies found irregularities in how it was signed. Former Peruvian president Alberto Fujimori's defence lawyers said the Supreme Court decision to reduce the prison sentences of army intelligence agents found guilty of human rights abuses is "relevant" to his case. The armed forces of Peru have launched a campaign to rescue at least 50 children who are in the hands of the last surviving remnant of the Maoist Shining Path guerrillas. The capture in Peru of the last major leader of the Maoist rebel group Sendero Luminoso is a mortal blow to the movement that managed to survive thanks to its connection with the production of coca and cocaine in the north of the country. The Peruvian government will propose that the Organisation of American States review the powers of the Inter-American Commission on Human Rights (IACHR), and is seeking the support of Brazil, Colombia, Ecuador and Venezuela. The move is a reaction against a lawsuit brought against it by the IACHR. Peruvian President Ollanta Humala is taking an increasingly hard-line stance against protests, and is losing important allies less than five months into his term. Local residents and authorities in the northern Peruvian region of Cajamarca say they will continue to protest the Conga gold mine, despite the state of emergency declared by President Ollanta Humala. The armed forces in Peru, which already have an active role in fighting drug trafficking, are being given greater responsibility for maintaining public order under the government of President Ollanta Humala. They will now also be expected to crack down on illegal mining, and to intervene in social protests. "I caught tuberculosis, but I'm lucky because it's been cured," says Hernán Arévalo from his bed in the new hospital at the Peruvian prison of Lurigancho, one of the most crowded and dangerous in Latin America. "Before, whoever came in here was unlikely to get out alive." For the first time, a representative of the indigenous communities in Peru's Amazonas region is sitting in Congress: Eduardo Nayap, an Awajún leader who played a central role in the lengthy protests against laws that opened up native territories in the rainforest to oil, mining and logging companies. The new president of Peru, retired lieutenant colonel Ollanta Humala, promised to make the fight against poverty and marginalisation the top priority of his administration. But his inaugural address was short on specifics, according to activists and analysts. Peruvian President-elect Ollanta Humala will push the legal system to investigate and prosecute those responsible for a massive forced sterilisation campaign targeting poor indigenous women carried out by the government of Alberto Fujimori (1990-2000), said the spokeswoman for Humala's party, Aída García Naranjo. Congressional candidates nominated by the party of presidential hopeful Keiko Fujimori to stand in the Apr. 10 elections in Peru failed to inform the electoral authorities that they are under investigation for drug trafficking and money laundering. United Nations High Representative for Disarmament Sergio Duarte said heads of state who call for a reduction in military spending should practice what they preach. Peru's Glass of Milk Programme (PVL) is failing in its aim of providing nutritional supplements to all poor children in Peru. But it has been a big business opportunity for the handful of companies that supply the programme, according to a special audit report seen by IPS.